Original digitally processed audio recording made with Panasonic PV-9000 VCR, Sony PCM-F1, PZM mics. < Digital audio transfer recording by Laurel Sercombe for UW Ethnomusicology archives. 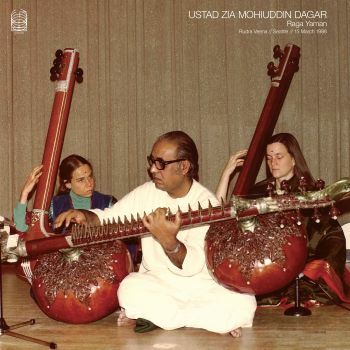 Around ten years ago, deep into a cozy and hazy night following a concert with my sound brothers Daniel O'Sullivan and Kristoffer Rygg in London (as Æthenor), they graciously introduced me to a recording of rudra veena (a kind of noble deeper bass relative to the sitar, in a way) as performed by dhrupad master Zia Mohiuddin Dagar. Raga Yaman was recorded at a public concert in Seattle at the HUB Ballroom at the University of Washington in March 1986 (the week after the accompanying release SOMA028 Ragas Abhogi & Vardhani was recorded) at the end of his last tour of the United States. Yaman was a special raga for Zia Mohiuddin Dagar, one of his signature raags. For centuries, Yaman has been considered as one of the most fundamental ragas in Hindustani music and is one of the first ragas which is taught to students. A deep knowledge of Yaman gives a key for understanding many other ragas. It's filled with tranquility, contemplation, pathos and spiritual yearning. .